One issue plaguing today's commercial battery materials is that they are only able to release about half of the lithium ions they contain. A promising solution is to cram cathodes with extra lithium ions, allowing them to store more energy in the same amount of space. But for some reason, every new charge and discharge cycle slowly strips these lithium-rich cathodes of their voltage and capacity. A new study provides a comprehensive model of this process, identifying what gives rise to it and how it ultimately leads to the battery's downfall. Led by researchers from Stanford University and the Department of Energy's SLAC National Accelerator Laboratory and Lawrence Berkeley National Laboratory, it was published today in Nature Materials. "This research addressed a lot of misconceptions in the field," says study lead William Gent, a Stanford University Siebel Scholar and winner of an Advanced Light Source and Molecular Foundry Doctoral Fellowship at Berkeley Lab. "There's a long way to go, but now we have a foundational understanding of the properties that lead to this process that's going to help us harness its power rather than just stab at it in the dark." "An unusual feature of lithium-rich cathodes is that the electron comes from the oxygen rather than the transition metal," says Michael Toney, a distinguished staff scientist at SLAC and a co-author of the paper. "This process, called oxygen oxidation, enables cathodes to extract about 90 percent of the lithium at a high enough voltage that it boosts the energy stored in the battery." But imagine in the sponge relay that with every subsequent soak, the structure of the sponge changes: the fibers stiffen and bundle together, eating up the empty space that makes the material so efficient at absorbing water. Oxygen oxidation does something similar. The authors' previous study, published in Nature Communications, showed that every time lithium ions cycle out of the cathode into the anode, some transition metal atoms sneak in to take their place and the atomic structure of the cathode becomes a little messier. The layered structure essential to the cathode's performance slowly falls apart, sapping its voltage and capacity. "This is the first paper that provides a complete model as to why these things are related and where a lot of the lithium-rich cathode's unusual properties come from," says Jihyun Hong, a Stanford and SLAC postdoc, now at the Korea Institute of Science and Technology (KIST). Toney says it took the combination of theory and many experimental methods, done at SLAC's Stanford Synchrotron Light Source (SSRL) as well as Berkeley Lab's Advanced Light Source (ALS) and Molecular Foundry, to disentangle this complicated problem. This combination allowed the team to conclusively demonstrate the strong driving force behind changes in the cathode's bonding configuration during oxygen oxidation. The next step, Toney says, is to find ways to produce those changes without totally disrupting the cathode's crystal structure. 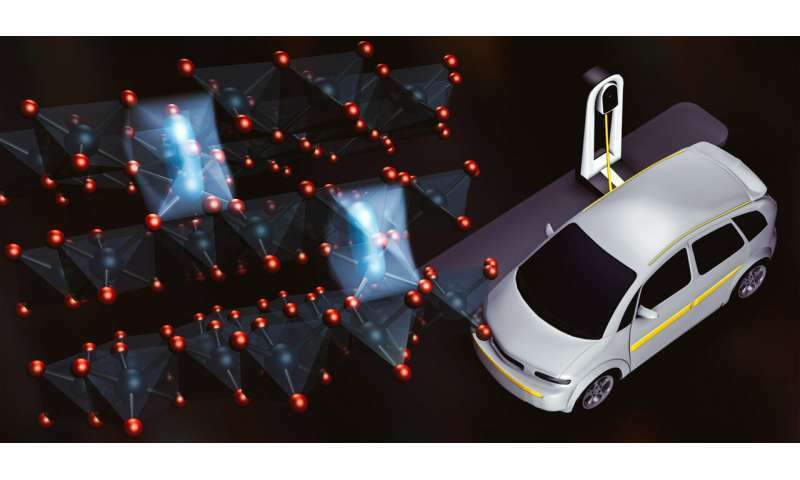 "Because oxygen oxidation gives rise to extra energy density, being able to understand and control it is potentially a game changer in electric vehicles," says William Chueh, Assistant Professor of Materials Sciences at Stanford, who co-led the study. "So far, progress in this space has been largely incremental, with improvements of only a few percent per year. If we can find a way to make this work, it would be a huge step forward in making this technology practical." Open a door, find 12 new doors.